Works in the landscape , particularly the urban realm,can act as useful points of orientation for travellers or as meeting points for local people. Unlike advertising hoardings, which change regularly and are designed to give up their meaning instantly, successful works of art remain enigmatic and open to interpretation. Stainleess steel, Granite, LED lighting system +plus poem (‘The Ballst Bank’) by Peter Finch. Commissioned by South Wales police . Design development: Mark Renn, Mick Thacker and Pete Whitehouse. A commission by Stratford upon Avon District Council. 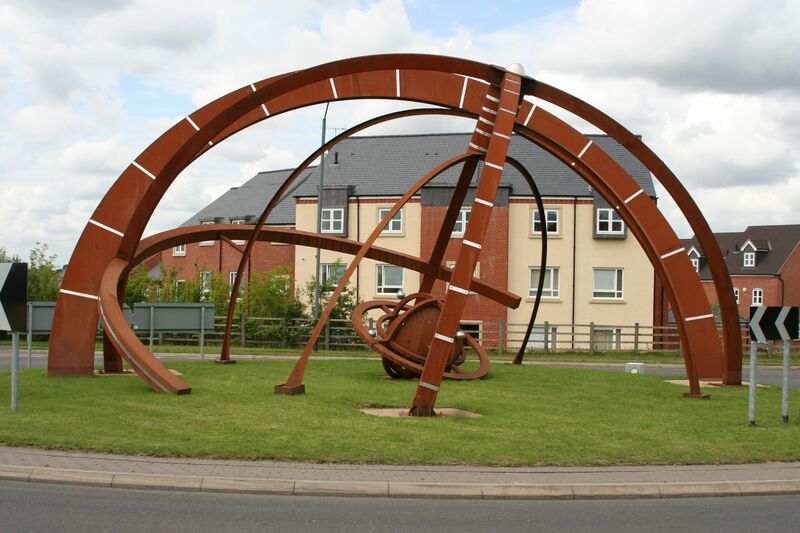 ‘The Copernican Gate’ came under verbal attack by one of the town’s former mayors’, making the artwork instantly controversial. This publicity seeking individual (who had previously exhibited himself sitting on a toilet outside the town hall, to draw attention to the town’s lack of public conveniences) stood on the traffic island with a banner, which read ‘honk if you hate this’. The story was featured on BBC Midlands Today as well as in the press. 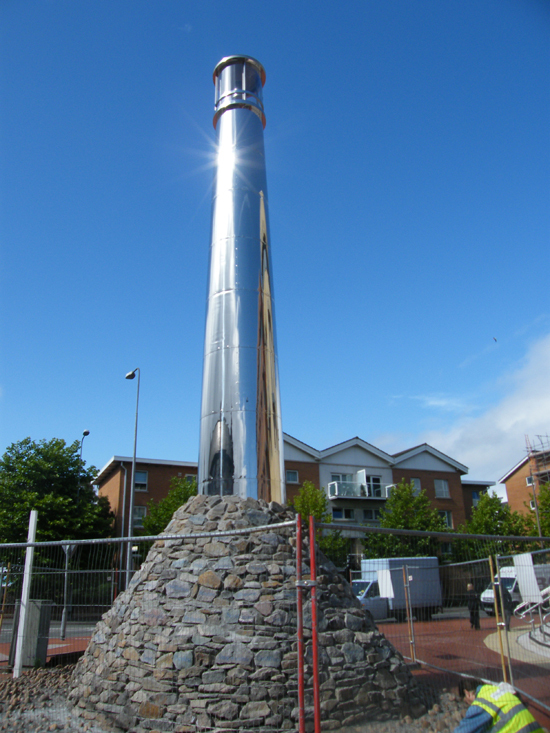 By 2009 the dust had settled and the sculpture has now been accepted by most people. Similar mischief is relatively common in the field of public art. For example, Anthony Gormley’s ‘Iron Man’ in Birmingham was attacked by The Birmingham Evening Mail who reccommended that the TSB bank – who had given the work to the city – take it with them when they were about to relocate. Imagine the newspaper’s surprise when brummies responded by saying that they liked the work and please leave it where it was. Mark Renn has had similar experiences in Walsall and with the Darwin Gate sculpture in Shrewsbury, where the local rag ran a ‘Hate the Gate’ campaign and divided the town for two years, although happily the work has now been accepted. Sculpture at Stourbridge Junction Station. The golden age of the Stourbridge glass industry was the 19th century, when many new firms were established and new colours and decorating techniques were pioneered locally. 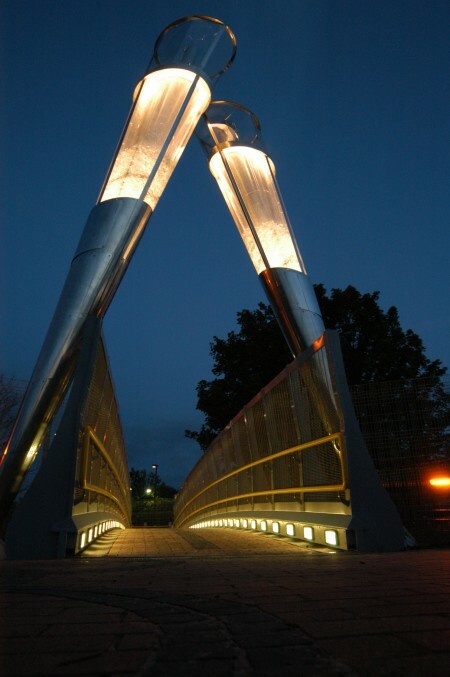 The scheme features two conical elements derived from the form of a champagne flute – which meet to form a triangular archway for the footbridge. Thus, the artwork is in the form of a toast – a toast in this instance, to Stourbridge Crystal. ‘Clink!’ The work is a celebration of the long past industrial might of this glass producing area of the UK. Winner of the Industry & Genius Award 2005 plus an award from The Royal Astronomical Society for low light pollution.